A fire broke out Tuesday at 5:44 a.m. at a paint shop in Singi-dong, Yeosu, South Jeolla Province. The fire was extinguished within about an hour and 20 minutes and no casualties were reported. Three people at the paint shop were evacuated. Then a container of paint exploded, causing the fire to get bigger, and another 15 other people had to be quickly evacuated from nearby buildings. About 300 people gathered at the scene, where firefighters from the Yeosu Fire Station brought the fire under control. Six fire trucks were deployed to prevent the fire from spreading to nearby stores. 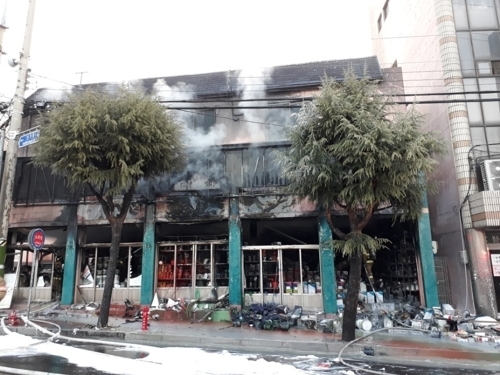 The fire caused extensive damage to the 290-square-meter shop on the first and second floors of the building, and vehicles parked nearby were also damaged. Police and fire authorities are investigating to determine the exact cause of the fire and the extent of the damage.